Hardback, 1st edn. 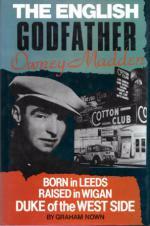 Owney 'The Killer' Maddon, declared America's most dangerous public enemy, was one of the most influential godfathers of organised crime during the 20th century. Born in Leeds in 1891, he emigrated to the US with his family at the age of 11. His family settled in one of the most notorious areas of New York, Hell's Kitchen, where Owney was drawn into a life of petty crime and gang violence. During the dry years of the Prohibition he ran a chain of speakeasies, selling bootlegged beer and smuggled alcohol with little opposition from the police, judges or politicians, many of whom were on his payroll. Exiled to Arkansas in 1933, he remained a supremely powerful underworld figure until the day he died in 1964. Illus., Bibliog. 204pp. 8vo. h/back. F. in F. dw.